The Samaritan features an extra-large display displaying ECG data, heart rate, number of shocks delivered and a text version of any voice prompts given the device. As well, the Samaritan comes with its own data management software allowing for stored information to be downloaded to a PC. Termed a ‘full rescue AED’ as it provides on-going feedback, the AED Plus also reinforces training through voice prompts as well as visual prompts. The M Series refers to Zoll’s emergency equipment including the AED Plus. This equipment includes mobile diagnostic and ECG equipment and the M-Series Defibrillator, a semi-automatic pacemaker monitoring unit. 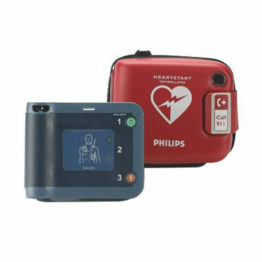 This AED has a long-life 4 year consumer battery, the same kind as used in digital cameras. Its removable data card allows for a variety of reports to be generated, transmitted and/or printed without taking the AED out of service. 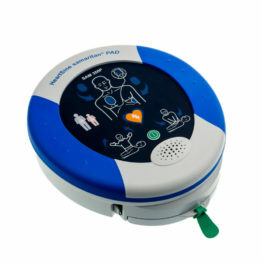 Medtronic manufactures two models of AEDs. 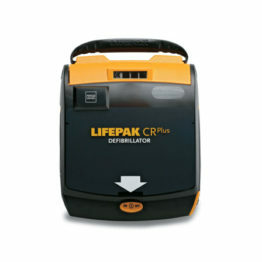 The LifePak CR Plus AED is available in both semi-automatic and automatic versions. Both are capable of delivering a defibrillation shock if the device determines one is needed. The LifePak 500 has 2 and 3 button versions. The 2 buttons are an On switch and a Shock function, while the 3 button adds an Analyze function. Both the 2 and 3 button devices can record, store and transmit event data. There are three different versions of the Cardiac Science Powerheart line of AEDs. The G3 Automatic eliminates the Shock button, instead delivering a shock as soon as its analysis determines one is required. The G3 Pro has a colour ECG display and a manual override, as well as multiple rescue capability along with continuous cardiac monitoring. The G3 model (with no further descriptives, unlike the Automatic or Pro) us Cardiac Science’s flagship unit, featuring voive prompts, a lighter weight than the others, and a 3 year replaceable battery. 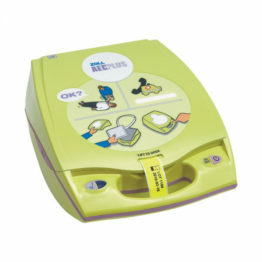 The FirstSave AED G3 is an economy model AED produced by Cardiac Science. 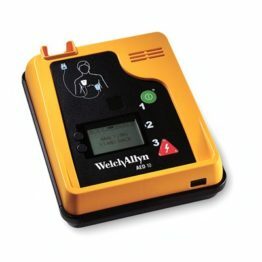 The principal difference between the two AEDs made by Welch Allyn are a larger display and a rechargeable battery with a charger station on the AED 20. 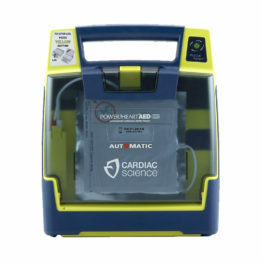 The AED 10 has a charge time of less than 15 seconds. 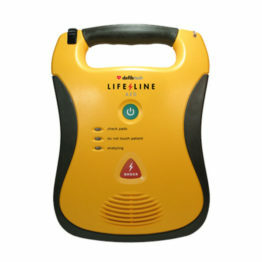 The only model of AED made by DefibTech, the Lifeline AED comes with a 7 year battery. Additional features include voice prompts, a text display and a removable data card capable of storing up to 12 hours of ECG and event data. The device also meets the US military’s shock-and-drop’ standard.